porous lava soil, and 100 year old Nerello Mascalese vines. 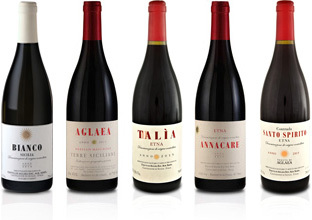 ‘Annacare’ made from the very best grapes of each vintage followed by ‘Thalia’ and ‘Aglaea’ make up my portfolio of three splendid red wines that I am now celebrating and sharing with a selective little crowd of admirers around the world. They are all made from Nerello Mascalese from old vines, the greater part pre-phylloxera at the steep terraces of the volcano Etna. The grapes are harvested by hand at the peak of maturity – when phenolic ripeness reaches climax, when sugar levels are perfect, and when I taste the grapes, and they tell me that it is time. Nerello Mascalese (selection Massale) is the only varietal in our wines. Nerello is considered most likely to be an indigenous Sicilian varietal, and is found in a large variety of clones. In my vineyards, due to old customs, I find also a few of the white carricante vines. These, however are harvested separately, and the grapes sold off. Nerello is a grape with unique characteristics, and is genuinely capable of expressing its background. It ripens late and slowly – how slow depends on the altitude that automatically provides for a cooler climate hence longer maturation period. The consequence is a grape that can offer a very distinctive and elegant nose - a very refined and aromatic profile all together.